12:03 am - So what now? Whither Brexit? Along with many of you, I’ve been pondering how we can get out of the mess that David Cameron dumped us in three weeks ago. I think I’ve found a way, which crucially might actually be agreeable to everyone who has a say in the matter. It gives us two possible outcomes: leaving the EU without too much pain, or remaining without too much strife. One undecided lady invited me in for a longer discussion. She seemed to be swinging towards Remain, and maybe I helped nudge her a bit further. Her main worry was the oft-stated democratic deficit in the EU. This seemed to be the most common concern of the day (in East Oxford, even those flirting with Leave have better reasons!). My argument (far from original) was that the referendum isn't on whether the EU is well run, but whether we would be better off (in all senses) in or out. If we are in, we can push for improvements - as we have (occasionally) chosen to do in the past (with some success). If we are out, we still have to live next to/trade with/negotiate with our neighbours, but with much less influence on them. The executive (EU Council; UK Prime Minister) are both chosen indirectly by Parliament. In the UK, we usually know which Prime Minister we are voting for (but maybe not if Boris takes over), and he is our chief representative on the EU Council. He chooses his UK Cabinet, who have specific responsibilities in the UK and on the EU Council. Parliaments: The EU parliament is directly elected by proportional representation. The House of Commons is directly elected, though not proportional to the total vote. The House of Lords is (mostly) indirectly elected (appointed for life by the elected government/opposition). In the UK, most laws are proposed by the Government, but in practice this is the Civil Service (under direction of the PM and Cabinet Ministers). Similarly, in the EU, all "laws" are proposed by the Commission. In both cases, the law must be approved by the parliament. The UK parliament can also initiate legislation, but "private members' bills" rarely pass. There are some differences between EU and UK in the balance of power between the different branches. On the other hand, I think a Council of (qualified) equals is more democratic than a single prime minister, and a proportionally elected parliament is better than the (distinctly less democratic) mess we have. Of course in the EU, it's not just the UK that has a say, but that's just a function of its larger size. If you object to that, then maybe I can ask for an independent Peoples' Republic of Oxford East. The last argument (also made by my canvasee) is that fewer people vote in EU elections, and often they reflect national issues. The same could be said for UK local elections, but in any case, this is an argument for better voting in EU elections, not voting to leave the EU. It's hardly democratic to vote (once) to remove voting forever. On Sunday afternoon, I helped out canvassing (knocking on doors) for Britain Stronger in Europe. This is the first time I ever did anything like that, and I must admit I quite enjoyed it. It was a bit scary to have to talk to all those people, though most weren't home so just got some leaflets through the door. With one group I did St Mary's Road (nearly all Remain), and with another Donnington Bridge Road (mostly undecided or uninterested). Unfortunately, when I tried again yesterday, I didn't find anyone from the Campaign (turns out they'd finished Iffley Village the day before but didn't cancel the meet). Today I went with Labour In For Britain (the time was convenient), canvassing on the Iffley Road. This was a large group of ~15 people with one organiser, who sent us off to knock on each door. I think I'm getting a taste of canvassing. Tomorrow evening (getting people out to vote) is my last chance for a long time! In my occasional efforts to keep you abreast of the latest results from the LHC, you might find this paper on heffalon production of interest - even if a day late. I thought the experimental methodology exceptionally robust, though there is an acknowledged fine-tuning problem with their theoretical model. C. Robin, W. T. Pooh, and Piglet will have to wait for the LHC energy upgrade in 2015 for their next chance at the Nobel (though I think it was Piglet alone who first proposed the heffalon hypothesis). I enjoy elections and think it is important to vote. So much so, I vote in two different countries where I am eligible to vote. The polling station was empty (apart from the tellers, one of whom was off making tea) when I went in at 5pm, so I guess most people are not voting. I told the teller that I was sorry that they had to be there, but he said he enjoyed elections. Even more than me, it seems! * Also, The Economist argues "If turnout in next week’s elections is really low, England and Wales (Scotland is sensibly sticking with police authorities) could end up with mighty figures who feel untrammelled by public scrutiny." 12:52 pm - Discovery, but is it a Higgs? After months of equivocation ("hints"), we can finally say that we have discovered something. It was all very exciting. I'm not used to hearing applause in the middle of a physics presentation. 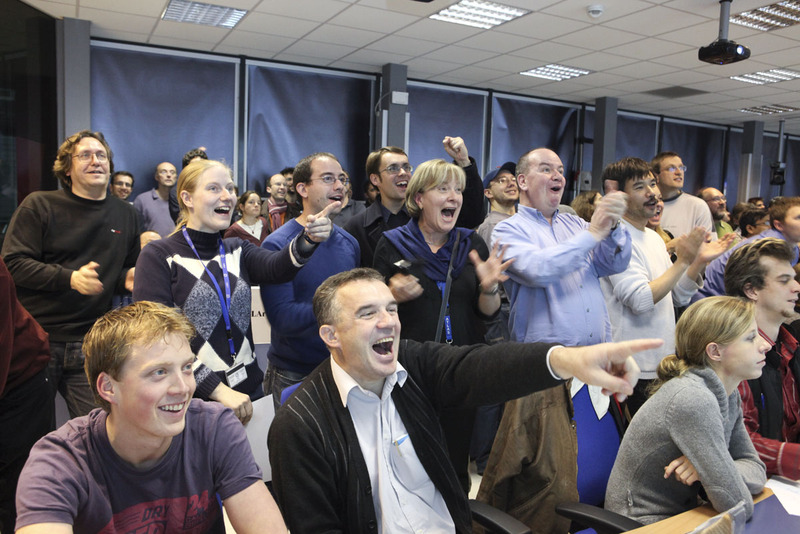 And the second time (ATLAS), they were applauding the number ("5.0σ") that I helped determine. There certainly was an observation of a Higgs, but that was Peter Higgs, who attended the presentation. But we can't say that what ATLAS and CMS have discovered is a Standard Model Higgs boson. The observations are compatible with a Higgs (though both ATLAS and CMS see a few more decays to two photons than might be expected, which is what pushed us over the 5σ line), but now we need to measure its properties to see whether it's a SM Higgs, some other sort of Higgs, or something entirely new and different. Today was an exciting day. Finally we can see our our new Higgs search results public, and we can see what CMS have seen and compare. As everyone keeps emphasising, we haven't discovered the Higgs. ATLAS has seen a fairly large "excess" and CMS have a couple of moderate excesses, one of which matches ours at a mass of 126 GeV. which give the significance (actually (im)probability that there is no Higgs at each mass) of the ATLAS and CMS results, separated into different channels (ways the Higgs can decay) and combined (in black) within each experiment. Those plots are the ones to look at to answer the question "did we see anything? ", so probably most interesting at this stage (nothing to do with the fact that I worked most on this one for ATLAS, though I was a small cog in an enormous machine). If this is a hint of the Higgs, then ATLAS was rather lucky to get such a large signal (though it is still not so large to be suspicious). If this is a statistical fluctuation, then ATLAS was really unlucky (as our spokesperson put it "if it's background, it will be really difficult to kill"). CMS's smaller signal was neither lucky or unlucky. These numbers have to be corrected for the "look-elsewhere effect" (the fact that we are looking for the Higgs at many different masses and if we look often enough we are bound to see a statistical fluctuation) - unfortunately this was not included in all the internet rumours that prefigured the announcements, so today may have been a bit of a let-down for some people. There is actually a philosophical problem with that correction: should we count everywhere we looked, or just the area that we are still looking (and haven't excluded). ATLAS and CMS actually took different options in their conclusions (probably because it doesn't make much difference for ATLAS, so they can be conservative, while CMS have nothing very exciting to say if they follow us). 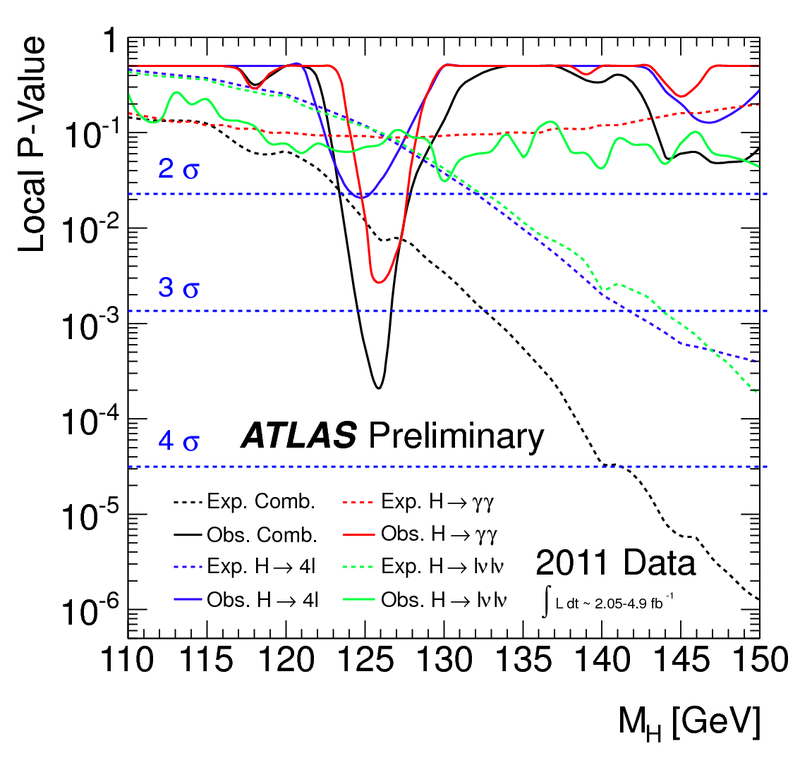 So ATLAS/CMS see a significance of 2.5/1.9 sigma (0.6%/3% probability that this is just chance, not a Higgs) or 2.3/0.6 sigma (1%/27%) for a Higgs at around 124/126 GeV, depending on how you calculate the look-elsewhere effect. It is quite incorrect to try to combine these numbers without detailed study (several of the uncertainties are correlated between ATLAS and CMS - it took months for ATLAS and CMS to combine their previous Higgs results), but that hasn't stopped the blogosphere. If you were to naively combine the larger set of numbers you reach 3.1 sigma (0.1%), which in our field is sufficient to claim "evidence" (still well short of 5 sigma required for an "observation"). But I couldn't possibly comment. For me, the fact that we see an excess at the same place in so many channels (3 channels in ATLAS, 1-3 in CMS, not to mention various sub-channels), makes me quite hopeful that this is something real. Each channel looks for different things (and the two experiments have different detectors and analysis techniques), so it is unlikely to be a mistake. That means it can probably only be a fluke if this isn't really a Higgs. Next year we hope to have lots more data (and at a higher energy), so we should be able to pin it down soon. I've been a fan of Isaac Asimov since I was a teenager. I read all his short stories and novels I could get my hands on, and it was probably his essays on science that did the most to get me interested in physics. So I have found it immensely cool that his name is being bandied about in so many discussions in the ATLAS combined Higgs search group. It is all down to a paper by some of my colleagues (two of whom I am working with now, and another who helped introduce me to another piece of statistics I am working on). They dubbed a representative data set, used to calculate expected sensitivities, the "Asimov data set" and cite Asimov's short story, Franchise (I should probably add something to Wikipedia). I remember the story well: it's about someone chosen by Multivac (a global supercomputer) as the sole voter, because his views are representative of the whole population. Since it has come up in so many discussions over the last year, I've followed the evolution of the term: "Asimov dataset", "Asimov likelihood", "Asimov method", "Asimov distribution", or just "the Asimov". I get a little thrill each time I hear a new one (I know, I'm a real fanboy). Despite this, what I've been doing in the Higgs group is to cross-check the asymptotic results, which use the Asimov method, using more traditional methods (known as "ensemble pseudo-experiments", or more informally as "toy Monte Carlo"). They don't rely on assumptions like large statistics (as did Multivac, or Hari Seldon, for that matter), but do require a large amount of computer time to generate many random pseudo-experiments. I developed a way to run these on the Grid. With hundreds of thousands of machines round the world, I have used 8 years of CPU time to generate 8 million toys in a few days. This sort of thing went into the results that generated some excitement in the summer (eg. p14-16 of the EPS conference presentation). I'm not allowed to say what we will show on Tuesday, but it should be worth watching. I'm on shift controlling LHC's ATLAS detector! There are about 15 of us, but I'm in charge of the Run Control system that is in overall control, so I say I'm the most important. I must say that, compared to DELPHI and BaBar, the ATLAS control room looks like a control room should with everyone in serried ranks facing the giant screen wall at the front. Like Mission Control, only with events and trace plots instead of trajectories and delta-Vs. 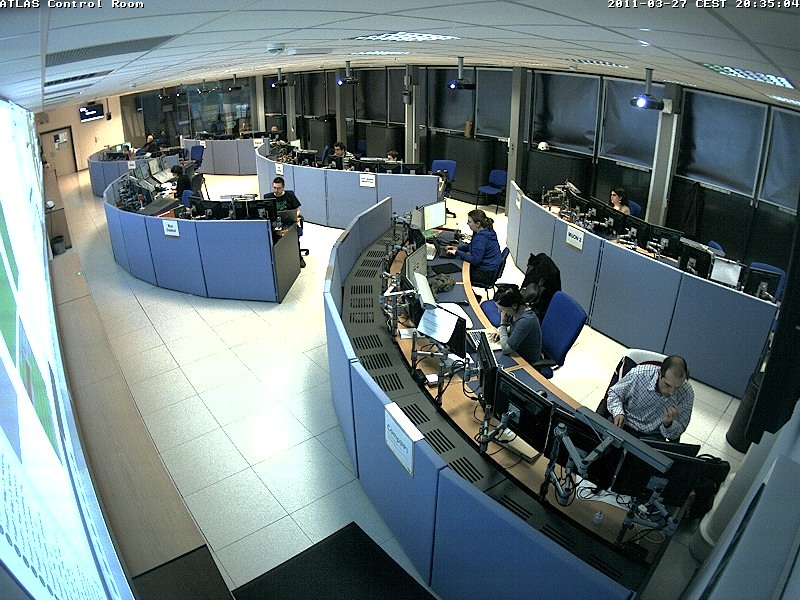 Here's me on the web-cam (first row, second set of desks). Since people have asked: I've done well at not creating a black hole and gobbling up the world. But in fact, my job would be to detect the black hole when the LHC produces one, so I guess I failed at that. I did start a couple of runs, the last of which lasted for 23 hours (and included some Van der Meer scans - named for the Nobel laureate, who recently died - where we could see the beams being moved back and forth on the beam position monitors). Unfortunately these are 2.76 TeV collision-energy runs, which we are doing primarily for comparison with December's heavy-ion data, and not of such interest to what I'm doing. Maybe when I'm on shift next week, we'll take some 7 TeV data. LHC just declared stable beams, and we're off again! Woot! The good news is much-anticipated: the first new TiVo model in the UK for a decade, and it arrived today! (According to the engineer, I'm the first customer to get one in Oxford.) It is very whizzy with dual-tuner HD recording direct from the cable and integration with the on-demand services, YouTube, etc. It has some annoying features (especially having to enter a PIN every time one wants to watch a recorded 15-rated programme before the watershed) and lacks some things my old TiVos could do (notably copying recordings to PC and no hacking), but is mostly a big improvement. Mitch Benn's Proud of the BBC is great (thanks to bibliogirl for the first recommendation). Go watch it now. That's a fantastic song, but I'm not sure I can fully get behind the sentiment. Most of my BBC favourites are from some time ago. There are many excellent British programmes not on that list, mostly made by Channel 4. I am watching much more US TV nowadays, mainly because the BBC is producing much less good drama these days. (I don't even have an LJ icon from a BBC programme.) Maybe I can say I'm proud of what the BBC was and proud when it still, too rarely, produces something brilliant. Cool look at Diamond, the synchrotron at my workplace. The Blade Runner soundtrack led to wistful thoughts: where's my flying car? (Maybe that's how they took the aerial shots.) Why isn't RAL infested with killer sexbots? Why can't I find a better life offworld? I don't travel much, except to the usual places (and not much of even that of late), Geneva and San Francisco. But today I'm at DESY in Hamburg, so here are a few trivial observations. Hamburg has lots of trees. This was obvious even from the plane. DESY is like CERN on a weekend, but with German instead of French. And lots of trees. (Until recently, DESY had one of the major world accelerators, HERA. I imagine that when HERA was operational DESY was much busier.) The style of buildings, rooms, streets, etc is very like CERN. (One of my RAL colleagues told me that DESY was "like RAL, only more run-down", but I really don't see that.) I guess that won't mean much to anyone without a familiarity with particle physics labs, but maybe with some google-streetviewing, I could demonstrate - a project for later, perhaps. In Germany, people rap on the table instead of clapping at the end of a talk. I vaguely remember this from a meeting I organised in Karslruhe, many years ago, but it came as a surprise. I think I like it. I like my role as an undecided voter in a marginal constituency. It almost feels like my decision will make a difference this time. OK, I'm not entirely undecided, but I'm still allowing for the possibility that Andrew Smith can persuade me back into the Labour fold. That is hampered by the fact that I've never actually heard any of the Oxford East candidates speak (except Andrew Smith on TV, when he was a minister): since I work outside Oxford, I've only ever managed to get to the Wantage hustings near my work. That's always been Conservative (never one of the options I'd support), apart from when Robert Jackson defected to Labour. This time a friend directed me to the Climate Question Time tomorrow (Wednesday) evening, so I should finally get to see the candidates debate. Hurrah! No sign of debates on other topics, but I still hold out hope. The Party Leaders' TV debates are good too of course, but we vote for MPs, not PMs. 03:05 pm - Happy Birthday, Kzin! I don't know exactly when his birthday is, but we were told that he was 13 weeks old when we got him, so he is about a year old now, and officially no longer a kitten but a grown up cat. He's certainly now a cat about town, a cat of the world, a cat who knows what's what. But even so, after a hard day's prowling the garden and environs, he still jumps on my lap and insists on being stroked. Or playing fetch with his toy mouse. Or peering between the banisters at me as I go down stairs and bumping noses (though this is rarer, as usually he'll follow me down). Or collapsing on my feet, rolling on his back, paws folded in, the unbearable cuteness of it making it impossible not to tickle his tummy. Maybe someone who has caught Kzin on virtual film can post a photo in the comments? We only got our first physics data from the LHC on Tuesday, and they are already planning its successor! Here's how we feel about all the beautiful collision data ATLAS has taken over the last few weeks. 01:36 am - The LHC is back! First beam splash events of 2009 have been recorded this evening in ATLAS (follow link to event displays). Woot! This is where we were last year, just before the accident. Hopefully we can soon move onto colliding beams, initially at 450GeV per beam, allowing us to better calibrate the detector. If all goes well, we hope to get 3.5TeV per beam, and the start of real physics, either just before, or just after Christmas. I die! There is a great celebration in the land as news of my demise spreads. Workers up tools to dance in the streets, lighting bonfires to burn my effigy. Crops are not harvested, production lines grind to a halt, investments left to fail. As the cities burn and civilisation crumbles, starvation is not far behind. Cursing my name, all that I stood for, and all that I caused, all die! O the embarrassment! This seems like a good way to encourage people to make significant contributions to helping tackling poverty. The web site also has useful resources to help decide on the most effective charities. Looks interesting. Geoff Ryman, Gwyneth Jones, Ken MacLeod, Adam Roberts, et al. We were becoming quite worried. For two days, the only signs of Kzin were occasional rustle, occasionally eaten food, and used litter tray. Then this evening, while we were watching Weeds, emily_shore noticed him sitting on his bed watching us. We kept still as he wandered around the room. He became very interested by both our slippers (not on feet) and then alternated between interest and trepidation as we proffered, then wiggled fingers and toes. After some time of this, I got a kitten toy (sparkly rattly ball with feather on a stick) and enticed him with jiggles, then rapid movements and all. We all had fun as he batted, pounced, and chased for much of the evening, slowly gaining confidence. We both took photos, though he's barely visible in mine (poor light - see how I need a gPhone! ), so you'll have to wait for emily_shore's. Later, when Emily had gone, he even consented to being stroked a few times, while purring continuously (even for a minute after he'd moved out of stroking range). There's still some way to go (sitting in lap, other people, especially jackfirecat, and other parts of the house), but it's surprising how rapidly he gained confidence after hiding for so long. I hope he doesn't forget tomorrow. After jackfirecat heroically agreed to attempt to acclimatise to cat allergens, after helpful advice from many people, and after positive vetting by Cats Protection (by phone and then by a home visit, which will be followed up by a further check-up later), we now have a kitten! emily_shore and I went with Arshad, our cat advisor, to see the kitten we were offered, called Willow. He was living with a foster carer, Avril, and her 10 other foster and own cats. Of course as soon as I saw him, I was sold - I hope Jack and Emily feel similarly. Arshad asked all the sensible questions, so I think we made we made a reasonable choice as well. Avril was certainly a font of all knowledge cat-related and we spent an hour learning about vaccinations (all done), neutering (required when he's old enough), favourite food, etc as well as filling in adoption papers. We each got a brief cuddle and he seemed quite amenable to being held. When we got him home, Jack joined us as we let him out of his basket. He emerged slowly, and then went straight under the chair and disappeared into the pile of boxes under the stairs. Since then, we've heard the occasional rustle, but the only evidence was once when Emily saw him visit the litter tray (what a well-trained kitten!) and a corner nibbled from his food. Avril had warned us that he was likely to hide for the first few days, but I hope he emerges soon. "Willow" is a good name, but my old laptop is called Willow, so it would only be confusing. In any case, I'd like to call him "Kzin". I hope he'll live up to his proud name, except for the bit about killing or enslaving all humans and other non-Kzinti. Since we haven't yet been able to catch him on camera ourselves, I made an icon from a photo of him last week in his previous domain. I'm sorry. I had such high hopes for it, but that was worse than all the worst bits of every odd-numbered Star Trek movie combined. It had a sillier premise than the one about God, a less believable baddie than Nemesis, more gratuitous emo plotfuckery than every Nelix episode ever. And even the cool red blob was nicked from the Shakespearian one (remember the pink Klingon blood? ), a film that this one was not worthy to serve as a alternate backup trailer for on a late night Dave rerun. OK, Kirk excepted, the resurrected Enterprise crew could have been fun. They looked the parts and I liked them. They would have made a good movie, if given a plot or behaviour that made a shred of sense. If only Dan Brown had written the script. That would have been more believable and self-consistent. So now I should go and see Angels and Demons and prove myself wrong. The Planning Committee unanimously voted to grant our planning permission this morning! Many thanks to the Councillors and all of you who have supported us. Mention was made of the numerous letters of support & comments on this web site - so you really did help & we are very grateful! We are obviously hugely relieved and are now able to move forwards to a brighter future. So common sense and compassion prevailed. 46 online comments (all in support) isn't bad for a planning application. Looks like my brother-in-law is causing controversy. Good for him, boo hiss for the Council! The web comments all seem to be supportive (hopefully good for his case), even if some do read like they were written by Daily Mail readers. Oliver gave an excellent presentation (our first PowerPoint OUSFG discussion meeting?) today on Dark Lords. So it is kind of appropriate that Toby's paper has just made Slashdot (and earlier the New Scientist and The Guardian), even if many of the summaries and conclusions presented there misrepresent the argument presented in the paper. In my underground lair, deep below the Jura mountains, I prepare to destroy the world. Foiled on my first attempt by an explosion, I continue to hatch my evil scheme. Having convinced the world that what I planned was completely safe, I aim to try again in the summer. With only months to go, my assurances are debunked; not by some mad American safety officer, but by a fellow Oxford-based academic and friend. Has Toby discovered my fatal flaw? Will he be able to prevent me throwing the switch and creating a black hole to swallow us all? Will our friendship be torn asunder as we are pitted against each other for the fate of the world? Find out in the next exciting instalment! Unfortunately for the drama, we ruled out groups from the category "Dark Lord". I am one of thousands of physicists working on the LHC. Also a Dark Lord must present a unique threat, and Toby's argument can be used for any number of other potential threats. So the programme, President Hollywood , that I mentioned when comparing the election to The West Wing , was fun enough, I suppose. It did mention a number of political films and TV programmes, some of which I'd not seen (although the programme's topic was the American presidency as depicted by Hollywood, it did mention other political films). not counting some, like 24 and Deep Impact , that happened to feature a president, but only in passing, I think. I've seen the ones I've marked in italics, and enjoyed them all. Yes, even Commander in Chief . I think my trash threshold must be much lower in films about politicians (just like, when TV SF was rare, I'd watch and enjoy anything that was vaguely SF). Actually Commander in Chief did deal with a few interesting issues, like whether the Equal Rights Amendment could still be passed. Maybe I should see whether there are any episodes I missed. Anyway, via the magic of BitTorrent/RapidShare VOD/DVD, I thought I'd try to see many of these, including rewatching some of my favourites, like The American President (Sorkin's first attempt at The West Wing). I've already seen All the President's Men recently (with emily_shore), as well as All the King's Men (with jackfirecat) and Inherit the Wind . I am kind of embarrassed that I've never seen Mr Smith Goes to Washington , so that's early on the list. It's Inauguration Day, and reality has finally caught up with The West Wing . I thought it would be interesting to compare the election campaign and transition portrayed in the last two seasons of The West Wing with the events of the last year. The parallels are striking - even though The West Wing was done two and a half years ago. You may have read about this, particularly when Barrack Obama first came to prominence. But the parallels have continued, and I'd like to document the ones I've noticed or heard about. Although it's fun to find similarities, it's also interesting to note the differences. I may have been obsessing about this for some time, but I'm sure there are many bigger West Wing and Obama fans on my flist, who can provide more examples. Please help! arda_unmarred asked for recommendations for books about Time Travel. As a particular fan of time travel stories, I commented. Perhaps others would be interested too. 04:45 am - Woot! Woot! Woot! Well, it's official. I've voted. Voting in California is more difficult than you might think, at least for the conscientious. As well as the national elections, there are also state, county, and city officials to choose. And then there are all the initiatives. Anyway, I sent off my ballot on Monday. Santa Clara county allows you to check online whether your ballot has arrived (cool, eh!). Mine arrived on Thursday, which is pretty good going. Years ago, I used to receive the ballot only days before the election, so I doubt that many of those votes counted. Now I know it does (barring gross fraud or incompetence). 11:28 am - Do you need a TV? Hi folks, do you know anyone who needs a TV? I am looking for a home for Tim's old TV. Here's the details. In the interests of full disclosure, I took this photo a few hours ago, when I first saw coalescent's post. It just took me this long to get round to uploading it somewhere. This photo hightlights two things. My boss thinks I should tidy those shelves. Pah! The first "beam-gas" events seen by ATLAS. These look rather messy because this is a collision between the (single) beam and a residual gas atom in the beam pipe. As soon as we get colliding beams, beam-gas events will mostly be background that we'll want to exclude - which is why an extreme vacuum in the beam pipe is so important. The available ("centre of mass") energy in a collision with a stationary atom is much much less than colliding with another counter-rotating beam (a quick calculation for this case gives a factor of 400,000 less). Given that I spent last week locked in Somerville anticommuting gamma matrices, you've probably seen more of the publicity than I have, but in case you missed it... tomorrow (Wednesday) has been dubbed "Big Bang Day". This is a media event when first circulating beams are injected into the LHC. As I'm working on ATLAS, one of the four-ish detectors that will get the results, I'm eagerly anticipating first collisions. However, that won't happen for a some weeks to come, once we have beams in both directions and they can be squeezed down and collided, so I'm a little embarrassed by the media interest in the switch on. They wanted a day that could be arranged in advance, and aren't sure how quickly they'll be ready for collisions (there will be an official opening on 10th October). All this means that if you believe that black holes, or strangelets, or whatever will destroy Geneva/the world/the universe, then you have a little longer to enjoy your last days. Probably you needn't really worry until the energy is increased from 1 to 10 TeV, since the Tevatron has been running for years at 2 TeV - and we are still here. BBC Radio 4 Big Bang Day. I'm looking forward to the radio episode of Torchwood at CERN. A nice explanation of why the LHC won't destroy the world. I liked this because they'd thought of more ways that the LHC might destroy the world that I hadn't thought of - and then demolished them. Newsnight Scotland item on last year's ATLAS meeting in Glasgow. A reasonable summary, but I like this one because I was at that meeting (the last full ATLAS meeting in the UK). I'd had dinner with the interviewee (Craig Buttar) just before he went on air. Cool fact (among many you can find in links above, but it was one I didn't know before a talk I went to last week): At full energy and luminosity, the LHC beams have 362 MJ each, equivalent to 80 kg of TNT. That doesn't sound earth shattering, except the point is they are squeezed to 17 microns - the width of a human hair (and 27 km long). 11:53 am - Don't blink! and I include this photo without comment, so you can go "oh wow!" See penwiper337's posts here (includes a lovely story at the end about how that second photo was taken) and here (making the costume). Thanks to sir_rosealot for the directions. I've been designing a device in my head. This ought to exist, but if it does I'm not quite sure what it would be called or how I could find it. Maybe some of you other techies out there can point me in the right direction - or set me straight. Actually, such a box could be used for all sorts of things: a personal web server or disk server (plugging in a USB drive) come to mind. I can also see various places they could be used at work: at the moment when we need a new service (DHCP server, say), it often entails buying a new PC for reliability, even though that is vastly over-specced for the requirement. One of these boxes could do the job. So, does such a thing exist, or am I missing some point as to why it's more complicated to do what I propose? Maybe a processor sufficient to act even as a home router, low-traffic web or disk server is more expensive or hotter than I imagine. Anyway, now we have to decide what to watch next. Neverwhere and Babylon 5 have both been mentioned. Also Buffy . Despite the number of Buffy fan(atic)s among her friends, and despite being the biggest Firefly fan evah, Shanith has never taken to the Slayer. I have been given a final opportunity to persuade her of the error of her ways, but I only have two episodes to do it in. But which two? The responsibility is awesome! It's a tricky because I can't use some of my most favouritest ones because they don't work on their own (too much build-up, eg. Innocence ; or too good to waste until you know the characters better, eg. Normal Again ). A lot of Buffy only comes into its own when you know and love the characters (just like Firefly, ahem). For a stand-alone, I think it's probably best to stick to the first couple of seasons. What impresses me about this list is that Wikipedia has so much detail on such insignificant places (well some of them are pretty insignificant). Wikipedia even mentions The Burgage, which is the lane where I first lived. It mentions it because it reputedly has a ghost, not because I was born there. I think of myself as being pretty sedentary, having mostly stayed put in Oxford, so I was a bit surprised by the length of the list - though I'm sure others' would be much longer. Suddenly all was darkness. Life and hope and Battlestar Galactica had been snuffed from our lives. So I went out in search of a better land where power flowed from every wall, and light was so common as to be unremarkable. In short, a land with Wifi. And coffee. So I say unto you, who remain in the dark land, come. Come into the light. Seek it out, as I have done. I known that you will not heed my words. Not because they are not wise. Not because you are foolish. But because you cannot hear them in the darkness. But at least I can warn others of the darkness. I guess I need to find out more about my top three picks. I'd not even heard of Mike Gravel before (shows how shallow my knowledge is on a subject that I am interested in). Still, it seems likely that they'll have pulled out by the time California votes ( emily_shore will decide for the rest of us!). Which reminds me: shouldn't I have received a ballot by now? ETA: Just checked: the California primary is on 5 February, so (on past form) I guess I should get the ballot in the next couple of weeks. I was going to call this "Please help save my job", but having been the victim of a previous cut, I am hoping that even if this thing goes through, I'll still have a job. But you never know. In any case, some of my colleagues won't be so lucky. There's a petition to 10 Downing Street to reverse an £80M shortfall in funding for UK research into Particle Physics and Astronomy. Please sign the petition if you agree with it (and you are British citizen or resident - sorry, those are the rules of the petition system). I've seen several Downing Street petitions, but never one where I knew the proposer and so many signatories (I haven't looked through them all, but I did notice mr_snips in there).